Risk taking is somewhat enigmatic. On the one hand, risky choices in every day life – like drug abuse or drink driving – peak in adolescence. Never again in life is the threat to die from easily preventable causes as great. On the other hand, in laboratory experiments this risky choice peak in adolescence is absent. Instead, the readiness to take a gamble simply goes down the older you are. How can we explain this paradox? Perhaps, we should look at a tribe in the Amazon rain forest for answers. A group of psychologists from Duke University led by David Paulsen looked at risk taking in the laboratory. Participants had the choice between either a guaranteed mediocre reward (say, four coins) or a gamble with a 50/50 chance of getting a low (e.g., two coins) or a high (e.g., six coins) reward. This is reminiscent of many choices we face in life: do you prefer ‘better safe than sorry’ or ‘high risk/high gain’? 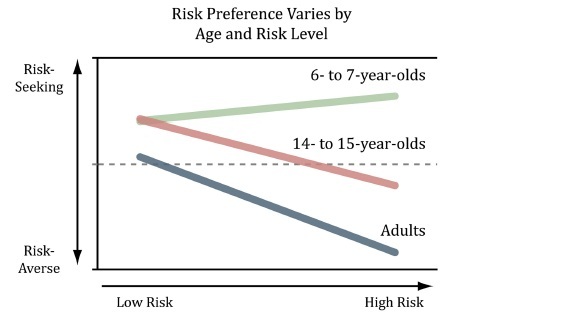 As you can see in their figure below, Paulsen and colleagues found adolescents to be greater risk seekers than adults. No matter how risky the gamble, adolescents choose it more often compared to adults. Paradoxically, children are even more risk prone than adolescents. Moreover, the riskier the gamble the greater the difference to older people. Paulsen and colleagues have trouble explaining why risky choices in the laboratory do not show an adolescent peak which so many real world behaviours show. Could it have to do with laboratory risk being clearly defined while real world risk is unknown? Is it peer influencing which drives real world riskiness but is absent in the laboratory? Is there more thrill in real risk taking while lab experiments are so boring that thrill seeking doesn’t come into play? Perhaps. However, one explanation – which I, personally, found totally obvious – is not even discussed. Risky choices decline with age, true. But the opportunity to make risky choices increases with age. In Western society there are both explicit laws as well as implicit norms that prevent children from the opportunity to take risks. Take as an example alcohol abuse. Many people perceive a party without alcohol as mediocre. With alcohol, however, you take a gamble between doing something very regrettable (read, low reward) or having the time of your life (read, high reward). Where to test an alternative explanation: the real world. How does this play out across the life span? It is inconceivable to serve beers at children’s birthday parties. However, the older you are the more you choose yourself what is served at your parties. When you are a young adolescent this increased risk taking opportunity meets a still high (but declining) risk taking readiness and you get wasted. So, with age, risk taking goes down because the opportunities to take risks do not get more after a certain age while the readiness to take these risks still declines. The outcome would be a peak in real life risk taking at adolescence despite a linear decline in risky choices, i.e. exactly the observed pattern. This interaction between risk taking opportunities and risk taking readiness is nicely illustrated by a native American tribe Dan Everett described in his very readable book Don’t Sleep, There are Snakes. The Pirahã do not have the Western notion of childhood. Everett writes that ‘children are just human beings in Pirahã society, as worthy of respect as any fully grown human adult. They are not seen as in need of coddling or special protections.’ (p.89). As a consequence, ‘there is no prohibition that applies to children that does not equally apply to adults and vice versa’ (p.97). Once a trader gave the tribe enough cachaça [alcohol] for everyone to get drunk. And that is what happened. Every man, woman and child in the village got falling-down wasted. Now, it doesn’t take much alcohol for Pirahãs to get drunk. But to see six-year-olds staggering with slurred speech was a novel experience for me. So, perhaps this solves the paradox. The laboratory results were unrealistic by Western standards because they gave children a choice which they usually do not have: sure reward or gamble? Once you look at societies that do give children this choice you see that the laboratory results line up better with real life. There is much to be learned by going beyond the laboratory and looking at the real world. The entire real world. If you were not entirely indifferent to this post, please leave a comment.